When trying to cook in a healthy, budget-friendly manner, you can never go wrong with beans. I actually have a cookbook on my kitchen shelves somewhere that is dedicated only to beans! I should dig that thing out! For now though, I've come up with this slow-cooker soup recipe to use up some chickpeas that I have. I thought it would be a good idea to start going through my kitchen pantry and freezer to try to use everything up so that I could start from scratch this season. I soaked and cooked a whole bag of chickpeas this week. You'd think maybe I might have thought to only do a half bag or something. . . . but, nope. . . . I did the whole darn bag. That's creating a need to come up with some chickpea recipes this week to use all those things up! 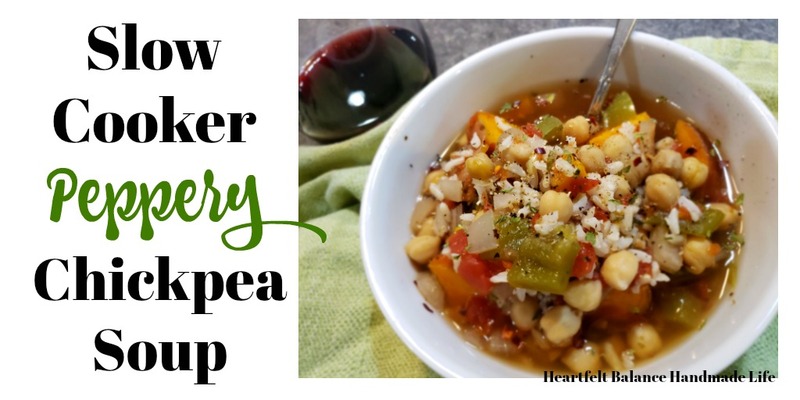 This slow cooker Peppery Chickpea Soup uses those chickpeas and some cooked rice I already had in my fridge. I used both ingredients to make my Chickpea and Lentil "meatballs" the other day. Now, the chickpeas and rice are going into this soup. 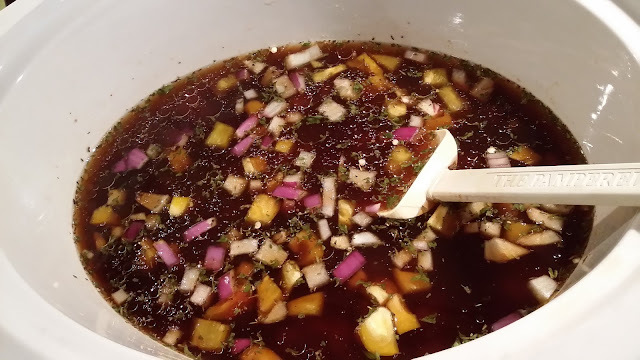 Add all ingredients except rice to slow cooker and cook on low for 6 hours. Add pre-cooked rice in last half hour of cooking. Enjoy your healthy, budget-friendly meal! 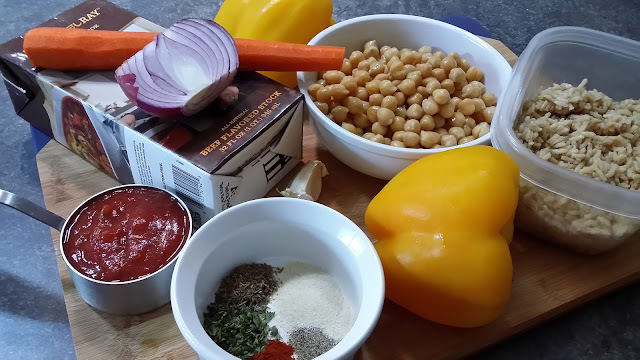 What's your favorite chickpea recipe? Here are some other recipes that use chickpeas that you might enjoy! That sounds absolutely delicious! It is coming into our colder months here & I love using my slow cooker for soups & stews, so this one is definitely a contender! We are page neighbors on Friendship Friday this week, you're most welcome to drop by for a cup of inspiration anytime! Thank you & Thanks for the invite! Enjoy your colder months and getting cozy with your soups & stews! This looks like a yummy way to eat chickpeas! I usually put them on salads, but will have to try them in a soup. Stopping by from the #HomeMattersParty linky. Yes, you should try them in soup! So yummy. Thanks for stopping by!